Pathological changes typical of Alzheimer’s disease were significantly reduced in mice by blockade of an immune system transmitter. A research team from Charité – Universitätsmedizin Berlin and the University of Zurich has just published a new therapeutic approach in fighting Alzheimer’s disease in the current issue of Nature Medicine. This approach promises potential in prevention, as well as in cases where the disease has already set in. Alzheimer’s disease is one of the most common causes of dementia. In Germany and Switzerland alone, around 1.5 million people are affected, and forecasts predict a doubling of the number of patients worldwide within the next 20 years. The accumulation of particular abnormal proteins, including amyloid-ß (A?) among others, in patients’ brains plays a central role in this disease. 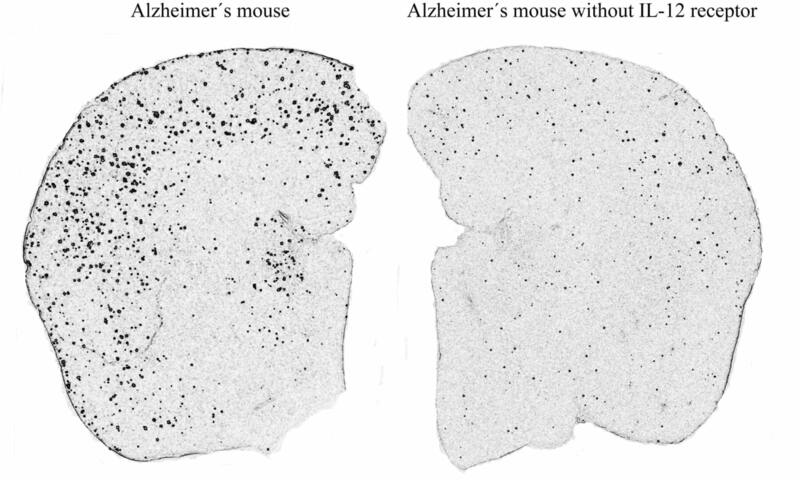 Prof. Frank Heppner from the Department of Neuropathology at Charité and his colleague Prof. Burkhard Becher from the Institute for Experimental Immunology at the University of Zurich were able to show that turning off particular cytokines (immune system signal transmitters) reduced the Alzheimer’s typical amyloid-ß deposits in mice with the disease. As a result, the strongest effects were demonstrated after reducing amyloid-ß by approximately 65 percent, when the immune molecule p40 was affected, which is a component of the cytokines interleukin (IL)-12 and -23. Follow-up experiments also relevant for humans showed that substantial improvements in behavioral testing resulted when mice were given the antibody blocking the immune molecule p40. This effect was also achieved when the mice were already showing symptoms of the disease. Based on the current study by Prof. Heppner’s and Prof. Becher’s team, the level of p40 molecules is higher in Alzheimer’s patients’ brain fluid, which is in agreement with a recently published study by American colleagues demonstrating increased p40 levels in blood plasma of subjects with Alzheimer’s disease, thus showing obvious relevance for human therapy. The significance of the immune system in Alzheimer’s research is the focus of current efforts.